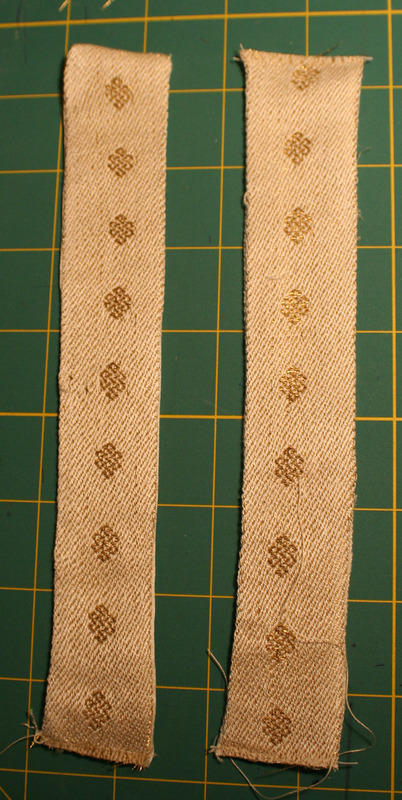 The one on the right has both ends zigzagged, cut off, and treated with Seams Great.Â The one on the left has the top end stitched and turned inside out, and the bottom end zigzagged, cut off, and treated with Seams Great.Â I think I actually prefer the version with both ends zigzagged and cut off; the look is more consistent, and the version with one end stitched and inverted has a tendency to curl. You can’t see it in the photo, but the one on the left is backedÂ with the charmeuse lining fabric, and the one on the right is backed with the dress fabric.Â While I like the idea of having a double-sided bookmark with dressÂ on one side and coat on the other, the charmeuse-backed bookmark is considerably thinner and drapier, which makes it a better bookmark, I think.Â But the other one is acceptable as well, so I’ll have to take it off and think about it. I am not 100% happy with the workmanship on the bookmarks, but I expect I can do better given a few “practice” ones.Â With about 85 to make (75 guests plus some extras, just in case), I’ll have plenty of opportunity to practice! Yesterday I spent nearly all day working on my dress form.Â I apparently didn’t put enough mold release on it, so a large fraction of the plaster bandages bonded tightly to the form and had to be coaxed, scraped, and finally chiseled off (very gently so as not to destroy the foam underneath).Â But it’s just about ready to be mounted and covered – probably another day or two will finish the job.Â Then, of course, I have to make a second one.Â I hope the folks at CNCH appreciate all the trouble I’m going to for the display! Pix of the dress form later, of course, once I get it mounted and coveredÂ in fabric. Could you try doing just a straight stitch a scant quarter inch from each end and then fringing slightly (although you’d get sick and tired of pulling threads). On some booksmarks that I made I just ran a thin line of Seams Great near the edges and fringed–but they were heavier fabric than yours–might be too stiff.